Click here to see the collection of around 225 prints. Although they are predominately of Cambridge, there are also some of Cumbria, Derbyshire, Norfolk, Sussex, the Isle of Wight and London. The prints can be bought online and are also for sale in select shops in Cambridge. Click here for information on shops. The prints are individually signed, dated and numbered by the artist. Each print is strictly limited to the edition size stated under its picture. For most prints that is 250, and for some 100. This is the maximum number of prints made from that painting, regardless of size. The prints are high quality Giclée reproductions. They are of archival quality with the lightfastness rated in excess of 75 years. Before this they should show no signs of fading under normal conditions. 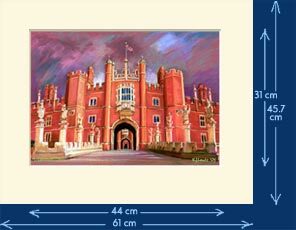 Mounted Prints : prints are presented in an acid-free bevelled hand cut pale cream coloured mounts wrapped in cellophane. The mount sizes fit into standard off-the-shelf frames. Framed Prints : the prints are avaliable in a choice of frames which can be seen further down this page. Discounts are available to some students and academics in Cambridge. Please see the Student Discount Page. If you are interested in buying several prints please e-mail for a quote. The prints are presented as shown, with the signature and edition number written on the printed area itself and with no white border. Framed prints are now available to customers in the UK. The frames are solid wood, and are glazed with real glass. 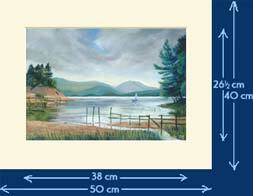 The frames available for the different sizes of prints are illustrated below. 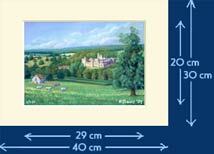 The overall size of a framed print is around 2 to 5cm larger than the mount size. It is advisable to check availability before placing an order for several framed prints. Due to demand I am now offering framed prints with a second aperture with your choice of words, for example to commemorate a graduation or retirement. The choice of prints can be found here. The image code is found beneath each picture. The internal measurement of the frames is 40x40cm and external measurement about 45x45cm. The limited edition print is the same size as for small prints (about 29 x 20cm). At the moment only available in silver frames as shown on the left. The mounts are cut to order, with the second aperture typically about 20x5cm. To order one please use the buttons below to enter your choice of print and frame and please supply the text you would like in an email. I'll then get back to you with a choice of fonts. Mini prints are supplied mounted for overeas orders. 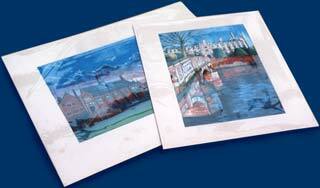 Small, Medium and Large prints are supplied unmounted. The printed areas have the same dimensions as above, with a white border around. Large prints are on paper that's about 48cm x 33cm, medium prints on paper that's 42cm x 30cm, and small prints on 30cm x 21cm paper. The prints are signed and numbered on the printed area itself.